Nomura: "Something Is Going On With The Chinese Yuan"
Yesterday, when looking at a chart of gold priced in yuan, a level which the PBOC appeared to be far more concerned about than the yuan-dollar exchange rate, we asked if the Chinese central bank had "lost control", because after managing to "peg" its currency at roughly 8,300 Yuan per oz of gold in Q3, something snapped this week when the PBOC appeared to lose its ability to managed the peg. Whether due to desperate liquidity needs elsewhere or defending stocks as they begin to freefall, the Yuan suddenly plunged back to 8,500 per oz of gold. 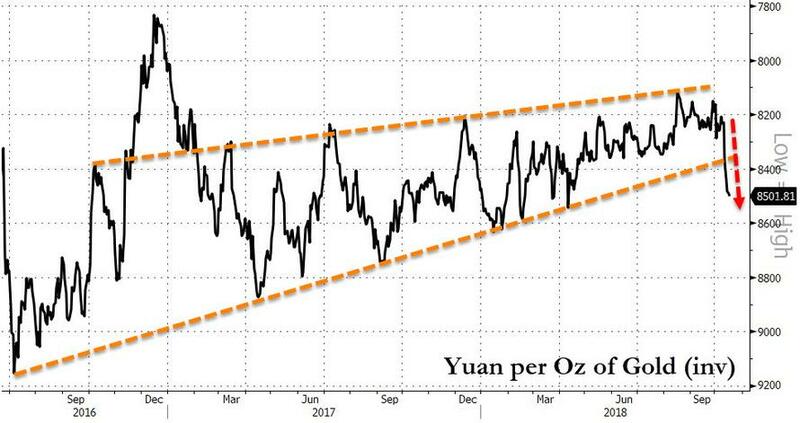 Just 24 hours later, the topic of the Yuan gold peg "breach" prompted Nomura's Bilal Hafeez to observe that "Something is going on in CNY." 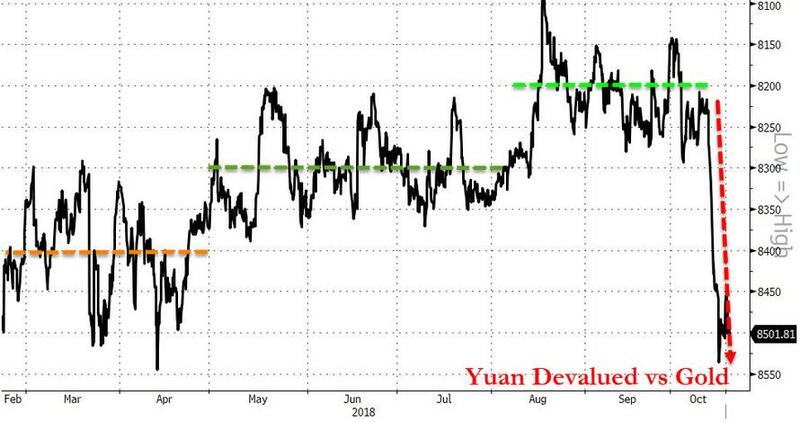 As the Nomura strategist writes in an email to clients, even though the dollar has not moved much against the euro or yen today, "the Chinese yuan is falling to new lows against the dollar. 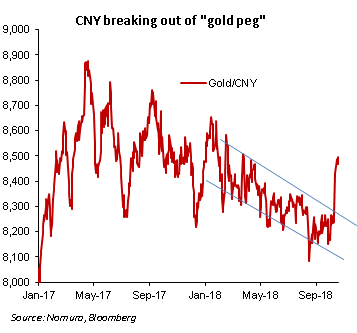 Not only that, but the tight gold-CNY relationship I flagged last week appears to breaking down with CNY much weaker than it should be." Echoing what we said yesterday, Hafeez observes that "this may suggest a regime change (of a weak CNY) is underway by the authorities." Alternatively, it could be that the CNY was held artificially strong ahead of the US Treasury [semi-annual report on currency manipulation] to avoid any conflict with the US and is now moving to its correct (weaker) value. The weakness could also simply reflect poor CNY fundamentals asserting themselves. Whatever the cause, Hafeez says that traders should watch USD/CNH and USD/CNY closely. The previous recent highs were 6.99 (CNH) and 6.965 (CNY). 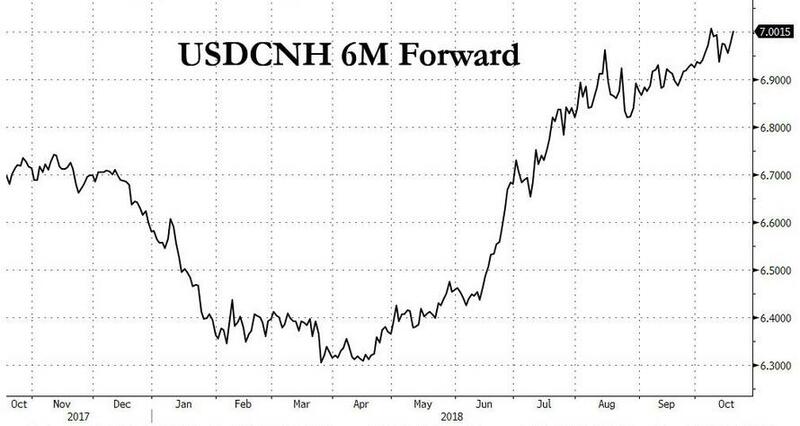 Specifically, when looking at onshore trading volumes for USD/CNY, the Nomura FX trader notes that "6.95-6.96 is an important zone, where activity becomes heightened", and that "a breach of 7.00 is on the horizon is therefore coming to fruition." ... perhaps sparking an even more violent round in the US-China trade/currency war.